Designed with a graceful and classical poise, this beautiful engagement ring from the Vera Wang LOVE collection features a halo design with a beautiful round brilliant centre diamond. The shoulders of the ring demonstrate exquisite detail with curved sides that are embellished by round brilliant diamonds and two signature blue sapphires on either side. 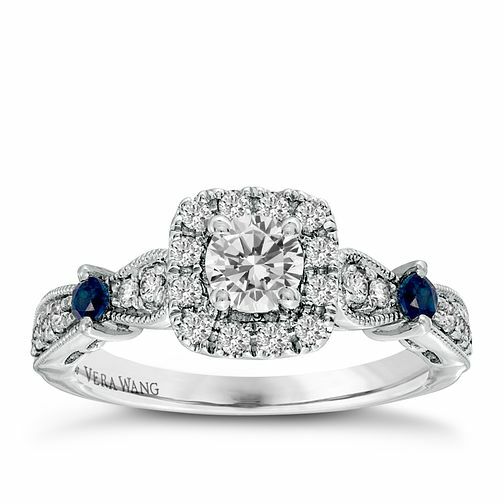 As an authentic Vera Wang piece, the inside of the engagement ring shank includes the Vera Wang LOVE inscription and her signature blue sapphire that sits underneath the setting. The combined weight of all the diamonds combined is 0.70ct. Vera Wang 18ct White Gold 0.70ct Diamond Sapphire Halo Ring is rated 5.0 out of 5 by 1. Rated 5 out of 5 by Anonymous from SuperB What can I say....She is so happy. The ring is beautiful!